D&B ClimateCare technician Tim Rapai checks refrigerant pressures. 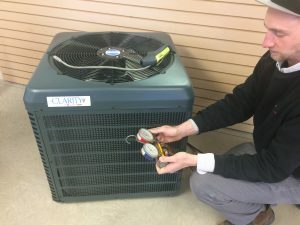 The Heating, Refrigeration, and Air Conditioning Institute of Canada (HRAI) has created a team made of up industry experts to examine and make recommendations on the introduction of flammable refrigerants. “Besides having obvious implications for installer safety, the new refrigerants may require changes in training, regulations, codes and standards, life cycle management and public awareness,” remarked HRAI president Sandy MacLeod. The Emerging Technologies Committee will study the issue, review the implications, and assess advocacy and research needs. Manufacturers are adopting lower global warming potential (GWP), some of which have varying degrees of flammability. “A high level of industry activity verifies the increasing urgency for action in this area. New refrigerant directions affect safety, efficiency, carbon footprints and business opportunities,” said Caroline Czajko, HRAI manager of divisions and regulatory affairs. North American Technician Excellence (NATE) is developing an exam for flammable refrigerants and the Air Conditioning Contractors of America (ACCA) has released a technical bulletin on flammable A3 refrigerants. Contractors should expect further guidance on safety measures and training opportunities from HRAI, added Czajko.